The redbreast sunfish is one of the largest sunfish, although it is slow growing. Individuals usually reach six inches by the age of two or three. Mature redbreast can weigh one pound; rarely 2 pounds or more. Despite its name, the belly may be yellow, orange, rusty, or reddish in color. Its opercle flap is considerably longer than other species, even the longear sunfish. 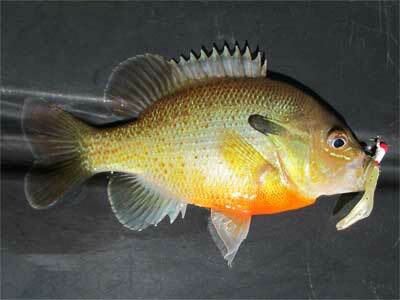 The historical range of redbreast sunfish included coastal streams of the eastern US. The species has since been introduced throughout much of North America. The species prefers clear, moving water with aquatic vegetation nearby. Redbreast sunfish are also known as river bream or redbelly.